BRAND NEW FLOORING FOR 2017! Gulf Stream #201 is newly remodeled, immaculate and gorgeous! We're not just talking about the views, though they are pretty spectacular too, with two separate decks and five sliding glass doors. The vistas from this unit are truly endless and can be enjoyed from your living room, master bedroom, guest bedroom private deck, extensive oceanfront deck or from Gulf Stream's community swimming pool. Each bedroom has a cheerful beach theme and custom dcor, which makes the setting even brighter. 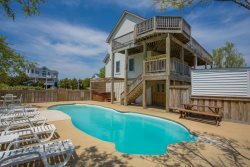 Beautifully landscaped and ideally situated on the oceanfront in Kill Devil Hills, the condo is across from the Wright Brothers Memorial Museum and near several popular restaurants and grocery stores. Hardwood and tile flooring is in the airy space throughout, and there is even a luggage lift for added convenience! Enjoy the privacy of only 8 units in the Gulf Stream complex, with two parking spaces for each condo and direct beach access. Need more than one unit? GS103 is located in the same complex. NO DOGS ALLOWED. One Level: Living area, oceanfront deck, computer work station, dining area, kitchen. King master bedroom with flat screen TV, deck access and private Jacuzzi tub; bedroom with 2 Twins and TV; King bedroom w/ TV. Full hall bath. We LOVED this condo! We have stayed in the one next to this twice until it went privately owned! It's the perfect location and you can get to everything in a short amount of time! We loved the beach access. The only thing that stunk was the tropical storm Hermine! We didn't think it was going to be that bad until around 1 AM we heard the wind and it was raining and kinda shaking the bed/condo haha first time for that one!! But that's life on a sandbar! ?? would recommend for anyone wanting a beautiful place, close to everything & ocean front for a wonderful price !! !